Dejero’s Transceiver is an integrated encoder and decoder that transmits and receives high-quality video in resolutions up to 1080p. The rack-mountable unit is designed to transport broadcast quality video over Dejero’s blended network including the Dejero MultiPoint IP video distribution network. Whether used for live broadcasts or transporting recorded content, the Transceiver integrates seamlessly into your IP video workflow. 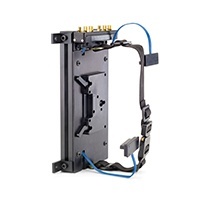 Useful in a variety of applications, the Transceiver is most commonly used in point-to-point and point-to- multipoint communications, as well as in remote production solutions. Built with industry-leading components, we source and use quality parts to ensure our equipment performs as promised and lives up to our high-quality standards. Capable of achieving performance of up to 20 Mb/s, the Transceiver can meet the requirements of the most demanding scenarios—especially for high-motion content like sports. Monitor performance and remotely configure the Transceiver with our cloud-based management system that gives you ultimate control from your web browser. Compliant with CEA-708-B and SMPTE 334-2000 specifications. Looking for a printable copy of the Dejero Transceiver product brief? 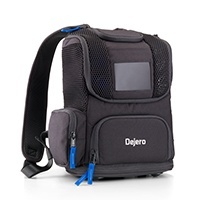 The sling bag can be positioned on your hip to provide easy access to the touch screen for controlling the EnGo and monitoring the shot. Or it can slide behind you and out of the way. 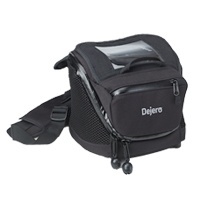 Features include an adjustable shoulder strap and pouch for accessories.